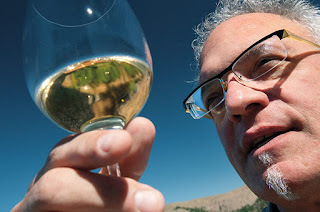 Alan Busacca got into wine through the dirt in which it's grown and Washington he carries as much weight as some of the state's most renowned growers and winemakers and for good reason: Alan is one of the original American Terroirists. The guy is not just a wine geek, he's a real deal geologist. While an academic at Washington State University, Alan, whose PhD is from U.C. Davis, began consulting with winegrowers and wineries on vineyard sites character and selection. Alan has also played a vital role in the AVA designations that Washington has been granted, his work has been used as part of the backing argument for those seeking AVA designation, and he's been part of the formal petitioning process in some cases. Through this work, Alan made a connection with the people making the wines. Alan found the winemaking and growing community to be "a heartfelt and wonderful group; one that was welcoming and really open to partnering." He decided to go in "whole hog" with the wine adventure and bought and planted the Volcano Ridge vineyard in the Columbia Gorge with long time Northwest wine grower Lonnie Wright. His other project, for which he's partnered with Robert Smasne to produce a higher end boutique wine, is the single vineyard Alma Terra Syrahs. The selection of Syrah and the single vineyards they honed in on was an academic one. Alan wanted his wine exploration to be an extension of what he'd learned in working with Washington's AVAs and vineyard sites. He ultimately sees wine as an extension of his educational and academic background, with wine as a vehicle to help people experience and understand how unique and special wine can truly be and the role that soils, sites, and other factors play in crafting what shows up in your glass. "We chose Syrah because, through his experience, Robert [Smasne] felt that this varietal was the most expressive when it came to its origins and vineyard sites." If Alan's goal was to really demonstrate the role that vineyard site had in crafting a wine, this was the varietal to choose, saying, 'While Syrah is having a tough go in the marketplace, I'm comitted to it." When it came to selecting vineyards to source their fruit, both Alan and Robert started a list of sites based on their own individual knowledge and experiences. Robert leaned on his many years of winemaking experience, thinking about the wines he's been able to make and the vineyards and growers he's worked with. For Alan, the list was about his expertise: site, soils, elevation and climate. When they cross-referenced their lists it became clear where they ought to look to make the wines they wanted: Red Mountain, Yakima Valley, and Horse Heaven Hills. Their combined knowledge confirmed that these were the right choices. Alma Terra is sourcing their Syrah from three vineyards in three different AVAs: Red Mountain's revered Ciel du Cheval, Yakima Valley's Minick Vineyard and the Coyote Canyon Vineyard within the Horse Heaven Hills AVA. These three sites provide incredible variety, from the hot Red Mountain to the cooler Yakima Valley. Vines are trained differently, the clones vary and most importantly, the soils, elevation and climate are different. The Alma Terra wines are serious and they're serious expressions of the sites. You can visit with Alan in his tasting room in Bingen, Washington in the Columbia River Gorge, located near the Volcano Ridge Vineyard project. Though it'll be a little while before we see those wines, if you were the betting sort, you could bet they'll be interesting. Took courses from Dr. Busacca at WSU some years ago. Great prof. I'm glad to see he's in the industry, so to speak! Cheers!